NEW YORK, NY--(Marketwired - May 14, 2014) - MagnifyMoney.com, a new website that provides consumers with a simple, unbiased way to comparison-shop for financial products, launched today. Created by former banking industry executives, the site leverages their knowledge to provide in-depth credit card and bank account comparisons. MagnifyMoney also provides tools to educate consumers about how to avoid some of the most common traps hidden in fine print. "Few consumers realize how much they actually spend on interest and banking fees because the terms are buried in fine print. Great deals are out there, but it can be difficult and intimidating to compare and choose the right product," said Nick Clements, co-founder of MagnifyMoney. "Our goal is to reward simplicity over complexity. We want to increase product transparency, force banks to compete and save people hundreds or thousands of dollars every year as a result." Unlike many personal finance websites that recommend products based on commissions they receive from financial institutions, MagnifyMoney provides completely unbiased recommendations. In fact, none of the products recommended on the site are based on sponsored results. The team evaluated hundreds of products from banks, credit unions and new entrants, offering detailed, impartial product comparisons. By utilizing MagnifyMoney's simple Money Finder tool, consumers can receive personalized recommendations for financial products, empowering them to make the best choices for their bottom line, not the banks'. MagnifyMoney believes that hard-working American families are paying too much for simple banking products. According to a national survey, 43% of Americans have credit card debt, paying more than $1,500 a year of interest while 35% of Americans have gone overdraft, helping fuel $32 billion of revenue in related fees for banks annually. And 72% of Americans keep their hard earned savings in bank savings accounts, earning almost nothing and giving up, on average, over $250 a year in lost interest. To reward simplicity in banking, MagnifyMoney is introducing the Magnify Transparency Score, which gives products an A,B,C or F grade, based on transparency and simplicity. Users will be able to easily discern whether a product is simple to use, or if it is loaded with fine print and complexity. Additionally, every recommendation comes with a "Fine Print Alert," leveraging the insider knowledge of MagnifyMoney's founders to help consumers avoid traps and tricks that could cost them. MagnifyMoney was founded in 2014 by Nick Clements and Brian Karimzad. Nick has nearly 15 years of experience working at top banking institutions, including Citigroup and Barclaycard, where he ran the UK credit card business. 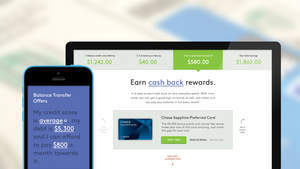 MagnifyMoney.com offers consumers a powerful resource with its personalized, side-by-side comparisons of banking and credit union products in a free, unbiased and easy-to-navigate interface. With its proprietary Magnify Transparency Score, banking and credit card products are graded based on simplicity and fee structure, making it simple for consumers to quickly evaluate which products have the least amount of fine print and most consumer-friendly terms. MagnifyMoney is headquartered in New York, NY.